Ever heard of "Leviathan"? Who or what is/are the Leviathan but a beast of enormous size and strength, most probably unstoppable; as described in the Bible, both New and Old Testament. Does Leviathan live, whether figuratively or in actuality? 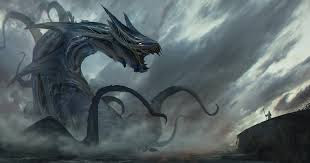 In the later, the seas house this creature (as before), but in the former, the spirit of this alleged creature goes everywhere, anywhere, where power and might--for the worse rather than better--roams the earth as a spirit(s), creating chaos and corruption among and within mankind. "Where the glory of God is," so too will Leviathan live, aiming to undo what God does, the grace and redemption of the Father through his son, Jesus. Yes, Leviathan lives and roams about--just as in the days of Job (the person and oldest book of the Old Testament). Can Leviathan be conquered or is it eternal, indomitable? Considering that the glory of God invokes Leviathan, it hardly seems possible since, if any might slew the beast, it would be God, right? As it is, we still must serve someone or body and thus the question is, given that Leviathan lives, is "Whom do I serve?" Do I/you serve God as a true servant or do we instead give room for Leviathan to enter, rendering confusion to our otherwise openness and obedience to God.